Navy Blazers — Anna Akbari, Ph.D. The navy blazer is an office essential, and with good reason. Blazers are an easy way to add structure and power to a look, and navy is equally versatile – it doesn’t require the same commitment as a true “hue,” and it’s not as basic as other neutrals. But just because you’re wearing a blazer, doesn’t mean you have to look “suited up.” Here are some great options with eye-catching details that you can dress up professionally or style more casually. Theory Viviette Blazer This Viviette blazer by Theory is a modern update on the navy office staple. The open asymmetrical front adds an interesting twist to the design, and the minimalist stand collar and slightly cropped fit makes it easy to layer with a collared blouse. Joonista Chiffon Back Blazer The daring chiffon back and oversized fit of this blazer are two great excuses to try integrating a blazer into a more casual outfit. Instead of looking buttoned-up, this piece can be used to add just the right amount of structure to a soft look. 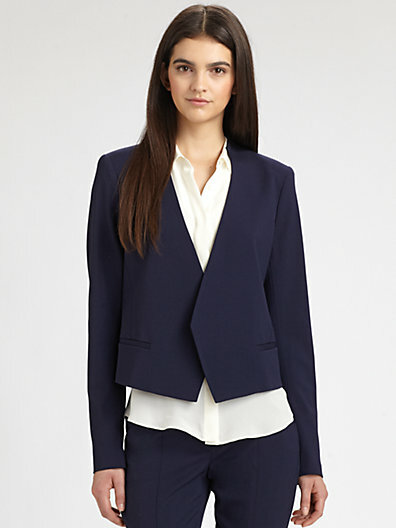 Olivia Moon Ruched Sleeve Blazer This classically tailored blazer by Olivia Moon features a three-quarter ruched sleeve that adds a casual femininity. Pair with a dress and statement necklace to accentuate the feminine-yet-powerful look. Calvin Klein One-button Blazer This Calvin Klein option will make you want to try out a blue with more “pop” than your typical navy. Details like the notched collar and back vent maintain its refined look and fit. Vila Blazer with Contrast Finally, this ASOS number will toss up your blazer game. The curved lapel and flap pockets feature contrast detailing. It can easily be dressed down with a pair of dark jeans and pushed up sleeves, but the tailored fit will also fit nicely with office-ready blouses and dresses.